Fourth Row Center: Film Writings by Jason Bailey: Sunday Matinee: "Being Elmo"
Forgot to post a streaming movie (again) last night, but no worries--this is probably a better Sunday afternoon movie anyway. Criticisms and nitpicks crumble at the feet of a documentary like Being Elmo: A Puppeteer’s Journey, a flawed documentary that has, at its center, the most unquestionably likable protagonist this side of Marge Gunderson. His name is Kevin Clash, and he is the fiftysomething Sesame Street performer who operates and voices the character of Elmo. Kevin started building puppets in his home as a child; he idolized Jim Henson and never missed a Sesame Street or Muppet Show. Those shows and those creatures brought him joy, and now he brings that joy to others. “When a puppet is true and good and meaningful,” Frank Oz explains, “it’s the soul of the puppeteer that you’re seeing.” Clash is all soul, it seems, all heart, and that’s the kind of thing you can’t fake—which is why we buy Elmo’s sweetness and love. This bio-documentary is a nice, even mixture of background and behind-the-scenes, equal parts the story of Kevin’s rise through the puppet world (with the help of some terrific archival footage) and peeks behind the curtain—or, more accurately, below the proscenium. The scenes of Clash training young puppeteers are fascinating; yes, now that you mention it, it does seem that Muppets always have their mouths open, because an open Muppet mouth looks like a smile. It’s a kick to watch these performers at work; it’s even more fun to get a glimpse at the Muppet workshop, drawers filled with eyes and hair and teeth. And the Elmo origin story is intriguing: Clash’s is the second incarnation of the character, the first (as seen on old tapes) a less distinctive version with an odd, almost caveman-style voice. The reason Elmo worked in Kevin’s hands was simple—according to a fellow performer, the character tapped into the “pure innocence part of Kevin.” Elmo was the accumulation of Clash’s life and experiences, and that is the principle strength of director Constance Marks’s work: we better understand the work because we better understand the man. His idolization of Henson also provides a dramatic arc for the film to follow; his recollections of their first meetings and initial transactions are still charged with the power of meeting a hero, and though it wrecks havoc with the chronology, the filmmakers are wise to use Henson’s passing as the film’s emotional climax. There is one major issue: the narration. It pops up, unexpectedly, at the five minute mark, and occurs irregularly throughout, clearly being used in the worst possible way—to spackle over holes left in the interviews. That’s not why it’s so problematic, though; put simply, the writing is appalling, obvious and cliché-ridden, and it is read by narrator Whoopi Goldberg with the over-inflection and condescension of a library story hour. Hey, Whoop—just because it’s a movie about someone on Sesame Street doesn’t mean it has to be narrated as though you’re on Sesame Street. The unfortunate narration is, in the grand scheme of the picture, not a huge deal, but it stops the film cold every time it pops up, and puts a drag on an otherwise enjoyable experience. The slenderness of Being Elmo (it runs a scant 80 minutes; I wouldn’t have minded a bit more than the glancing look the filmmakers give Clash’s regrets over his shortcomings as a dad) and the problematic narration might sink a film concerning a less involving subject, or a more amiable one. 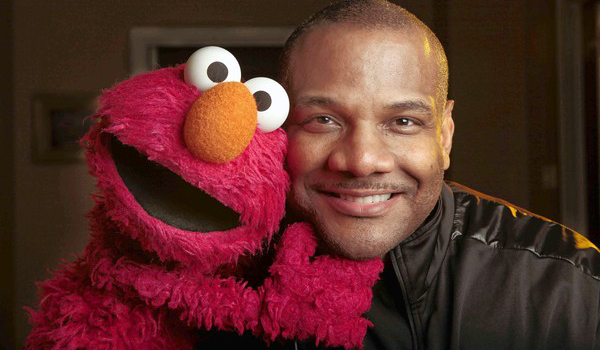 But those defects are easy to overlook here; Kevin Clash is a captivating and genial figure, and Being Elmo is a thoroughly charming documentary. "Being Elmo" is out now on DVD. (For full A/V and bonus feature details, read this review on DVD Talk.) It is also streaming on Netflix. In Theaters: "The Cabin in the Woods"
On DVD: "The Iron Lady"